I’d like to recognise Bev Hand, Kabi Kabi elder as representative here of the many wonderful traditional owners, past, present, and future who have for many thousands of years brought people and country together for celebrations such as this. Would it surprise you to know that I’m going to talk about place and art? We learn about the importance of place first by visiting sites of value, of significant cultural and natural heritage. We often first feel the magic of place in a cathedral, a rainforest, or a bora ring/stone circle. Allen and Katerina celebrated their meeting through a caravan trip of places around Great Britain. My facebook page became full of Allen and Kat cartwheeling in front of Stonehenge, St Paul’s, and many other key sites. I suspected there was something going on, but it was very early in their possible relationship. From such connections to place, we learn to value our own places and their more humble meanings. And here we are at this place, a place of importance to Katerina, her family home and the site of creativity and nature, art and environment. It is a place of increasing importance to Allen as well, especially as the site of their formalising of their already strong and loving relationship. 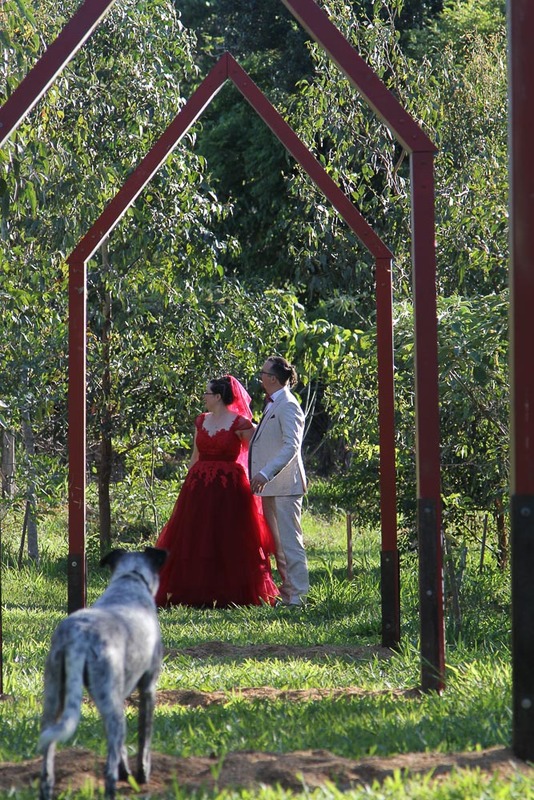 Here at this place, under the long view of Cooroora Mountain, we build connections to each other through creative and restorative work. As just one of many examples, our marriage celebrant Kari and the father of the bride Ross worked collaboratively together to make the Shemple (Shed and Temple) which we have erected along the piano path. It plays with perspective and teaches us to question our perceptions as well as being a beautiful skeleton place for performance and photos. Sort of like life, and marriage, perhaps? 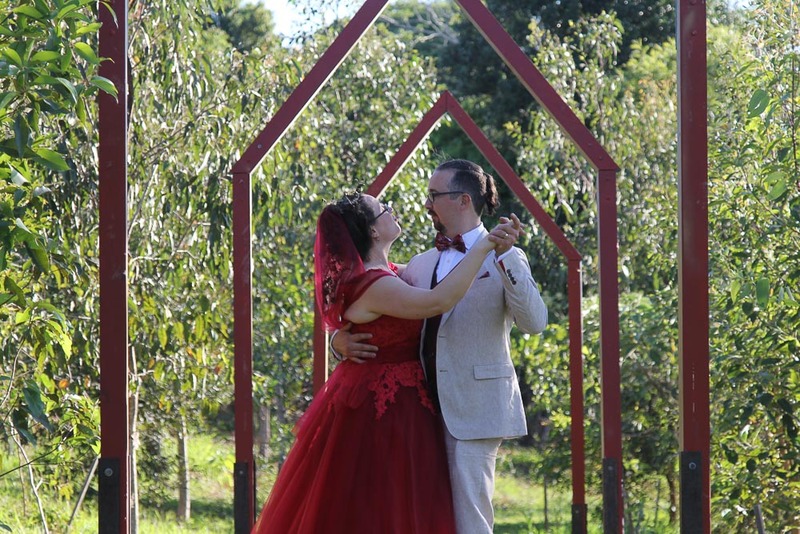 The Shemple’s temporary environment is in our new forest plantings, established at the same time as Katerina and Allen moved in together in their Canberra home. Both are growing with gusto and are full of hope for a long future. Kat and Allen’s ceremony borrowed rituals and symbols from a global and healing cultural diversity – east meets west, tradition meets exploration – reflecting Allen and Katerina’s own interrelationship. Places are full of not just the human, but also full of trees and birds, of soil and fungi, of wallabies and turkeys, of dogs and grass, of weeds and weavings, of myths and bunyips. Today two trees have played a vital part in this ceremony. The crows ash beside the outdoor stage has lived here the longest, surviving its time as the rare shade for cows and now providing the foldback and shade for the sound improvisations (such as Linsey) and performances (such as Matthew) that happen here. Today the crows ash overlooked the joining of two people and offered its seed cases as decoration. And the golden flowered tree under which we sit for dinner calls in the bees and hums with life, providing another form of music which helps bring us into the wide and wonderful flow of this earth. It too adds its falling colour to table and earth as a natural confetti. These two magnificent trees join the bunyas around the property in connecting people to place. The crows ash and the golden tree might also offer a metaphor for Allen and Katerina. Each bring that listening and blessing to each other that these trees and their inhabited placedness encourage. May Allen and Katerina’s relationship be full of such art and nature as that of the full life of these trees. The blessed music of bees and the fine promises of seed pods. 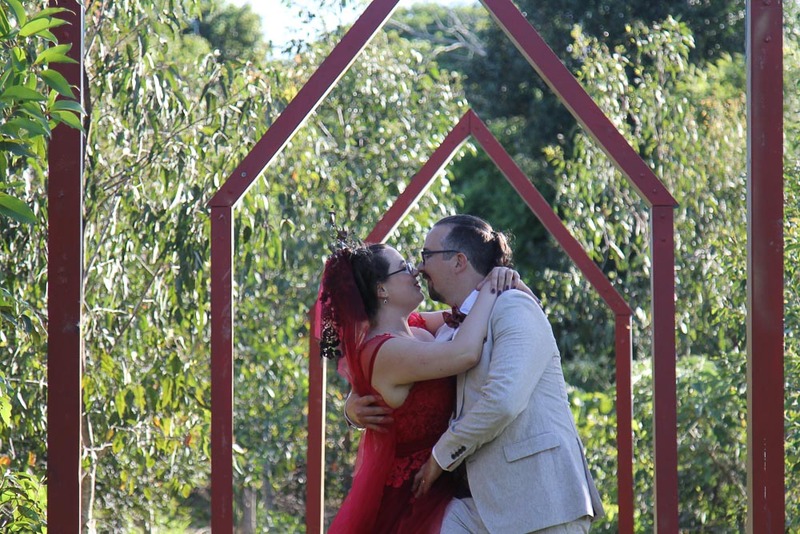 So, much gratitude for all who have come and contributed to this wedding ceremony, and hence helped in building the garden of this marriage – for what is a relationship without the coming together of, and support from, friends and family? From the flower arrangements to the welcome to country, from the setting to the catering, from the celebrant to the musicians, from the making of rings to making up and the make-up, from the presentations to the presents, from the mowing to the celebration, I’d like to say thanks for the collaboration we have all performed – for the circle of life that surrounds a strong foundation in this marriage between two loving people. To Katerina and Allen – may your life together be always so crafted within place, art, and nature. Dress by Katerina and friends, Kari as Marriage Celebrant, rings by Kat and Allen with Bill Dorman, Pot by Anika with contributions from family of stone, water, earth, ash, fire, flowers by grandparents Cynthia and Tony Annels, marriage tables by Ross, music by Matthew Farrell and Linsey Pollak, vows by Kat and Allen, decorations by crows ash and golden tree - an outdoor wedding full of nature and creativity of friends and family.